I’m happy to announce that, after almost 9 months of planning, fundraising, rehearsing, filming, and editing, the DVD of Piecework: When We Were French has finally been sent off for duplication. In just a few weeks, the duplicated copies will be in my hands and ready to be distributed to donors, supporters, and eager audiences far and wide. I think this means I have reached the point in the summer when I can put my feet up, have a margarita, and give myself a small pat on the back. I wish this point had come in June, or even July, but the primary thing I have learned from my forays into film is that it is a time-consuming medium to produce (the word “tedious” has been used by others). Every minute you see on a screen represents hours, if not days, of production time, and this modest little video has voraciously gobbled up most of my year. Nonetheless, I am excited to share the DVD with you soon. In the coming weeks, you’ll be able to order copies from this site, on-line or by mail. 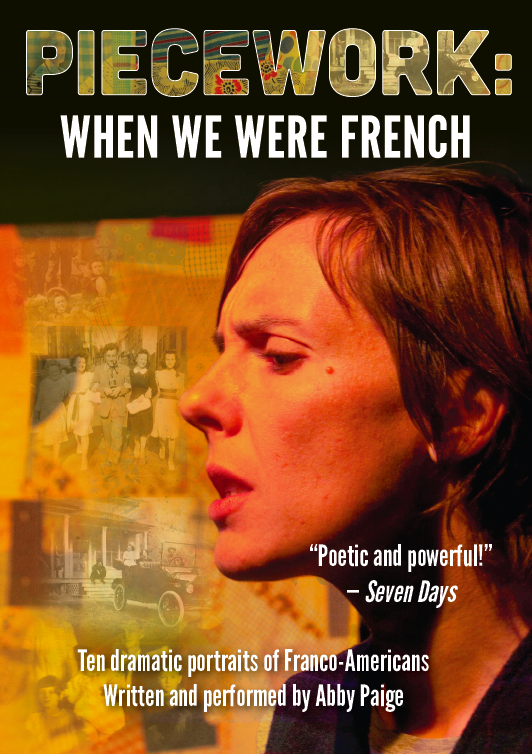 You will be able to order the DVD alone, or a special resource package for libraries and community groups that will also include a signed copy of the show’s script and a study guide with resources for further exploration of Franco-American history and culture. Check back here for details! In the meantime, to whet your appetite, here is a sneak peek of the DVD cover image, designed by Clare Talbot. As this project is now drawing to a close, I’ve been thinking about the cycles of beginnings and endings that are so much a part of a creative life. Arts work is very much project-based. This is true not just for artists themselves, but for those who work in curating, presenting, and funding organizations as well. I’m sure it’s true to a certain extent for engineers, landscapers, scientists, and other professionals, too. Lately I have thought admiringly of our neighbourhood butcher (yes, we have one) and teachers and caregivers, and marveled at all those of you in lines of work with a greater sense of continuity. I wonder what the challenges of such continuity might be. I wonder what work is like when not defined by a constant process of invention, exhaustion, and reinvention. As an artist, I always feel like a consummate beginner. I never know how to do a project when it begins — learning a part or writing a review, producing a DVD or even creating copy for a freelance client. I learn by doing, gradually, mostly feeling like an idiot along the way, and just when I begin to feel a sense of mastery, the project is finished. I look back at the path I blazed and think of all the ways it would have been easier if I had known where I was headed to start with. I experience endings with a kind of confused wonder. No matter how strong the final product, it’s almost never exactly what I intended to make, and I’m usually left feeling more perplexed than satisfied. What a puzzling way to spend one’s time. This is what I like most about theater: as long as a show is open, it is being developed, changed. It lives and breathes and continues to teach me, and there is never a definitive version it, no matter how many times I perform. The painter, sculptor, musician, the filmmaker — any artist whose work produces a final product — must resign herself to the permanence of that object, must accept it as the conclusion of a long conversation she’s carried on with her materials. With theater, that conversation feels more open-ended, and while there is always a closing night, there is never a sense that the process, the conversation, has been supplanted by any single version of itself. Of course, I have violated this proposition by putting Piecework: When We Were French on DVD, and that is perhaps why I am struggling a bit with its completion. To me, the DVD is not the definitive version of the show. It is a representation of a single performance, an example of what can happen when an audience and I get together and share in the characters and their stories and our collective sense of the human experience. I really do look forward to sharing that with you. Stay tuned for more news soon.